It’s Jeanne again … still obsessing over garlic. And it takes all of 5 minutes (the garlic chips … not the story). Peel and slice the garlic cloves VERY THIN. It’s key here that your knife is sharp. A dull knife won’t let you slice super thin garlic and you’ll wind up with a mash instead of a chip. And while there’s nothing wrong with garlic mash, that’s for a different recipe … so … sharp knife … garlic chip. Dull knife … mash. Pour olive oil into a still-cold-sauté pan. Add the garlic slices. It’s like when you’re making popcorn and you add the kernels to cold oil so the oil and the kernels heat at the same time, ensuring you’re not going to burn the kernels and have a mess of burnt popcorn all over the bottom of the pot, right? So. Olive oil and garlic go into the pan at the same time. Turn the burner on medium. Let them heat up together. And move the chips around a bit with your spatula. When the chips start to sizzle and barely turn brown on the edges (it only takes a few minutes), take them out of the pan and put on your paper towel to cool … leaving the olive oil (which is now infused with garlic) in your pan. Add your washed broccoli to the pan of hot garlic-infused-olive oil and sauté until bright bright green. 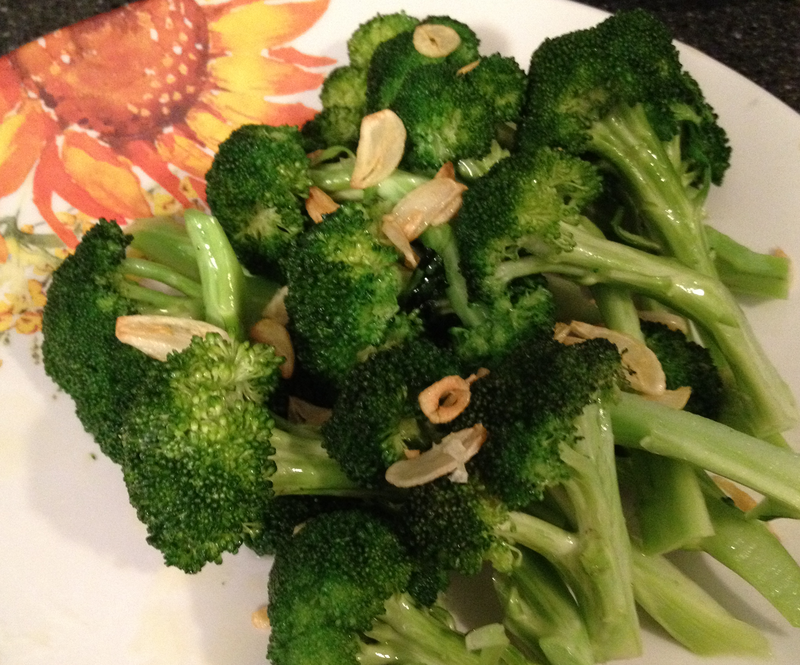 Broccoli goes onto a serving plate, topped with the garlic chips, and enjoy the clean plate when dinner’s done. By the way … I’m using broccoli because it’s what we have on hand … this works with most green veggies. Broccolini. Spinach. Haricot Vert. Baby Asparagus. Brussell Sprouts. Etc., etc., … I also like it with Cauliflower (which is only green sometimes). Basically … you can use this method with nearly any veggie you might just sauté and serve quickly.